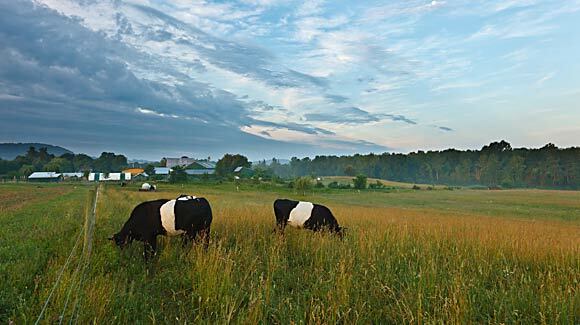 In June 2011, Scenic Hudson protected 95 acres of prime working farmland that are integral to the some of the area's most magnificent views. Livestock at Pleroma farm.Robert Rodriguez, Jr. This transaction, result of a partnership between the Open Space Institute, Scenic Hudson, Omega Institute and The Olana Partnership, preserves a working farm whose scenic fields and forest are integral to magnificent, unspoiled views from Olana. It ensures that the 170,000 annual visitors to the home of renowned Hudson River School painter Frederic Church can admire the same vistas that inspired him. A top regional tourism destination, Olana generates $7.9 million of economic stimulus each year in surrounding communities. The acquisition of a conservation easement on this property, which includes 75 acres of USDA Prime Soils and Soils of Statewide Significance, also guarantees it can continue contributing to the local agricultural economy and providing fresh, healthy food. (It currently supports a biodynamic farm raising poultry and Dutch belted cattle.) The land is adjacent to Olana State Historic Site and 175 acres previously conserved by Scenic Hudson. This transaction means 100 acres of contiguous mixed forest now are protected. It also safeguards 40 acres of wetlands providing important wildlife habitat.